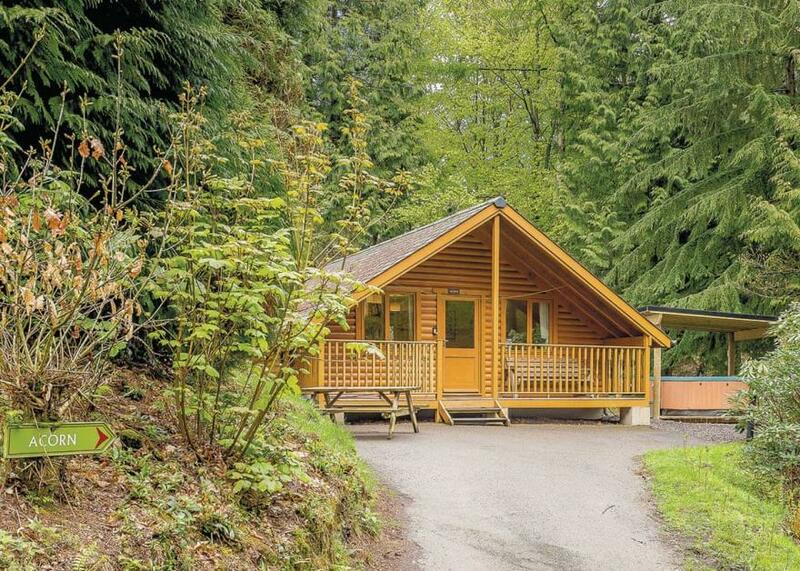 2 Cedar Lodge Park is a lodge on a holiday park, located near the market town of Tavistock in Devon. Hosting three bedrooms TV/DVD player in each room ; two double (one with en-suite facilities), and one twin, as well as a family bathroom, this cottage can sleep up to six people. Inside, you will also find a utility and an open plan sitting, kitchen and dining area with a fire. To the outside, is off road parking for one car and a decked balcony. Resting in a delightful setting, with popular attractions, 2 Cedar Lodge Park is a refreshing cottage in a heart warming part of England. A 4 star lodge in the prestigious Salcombe Retreats.. Steps to entrance. 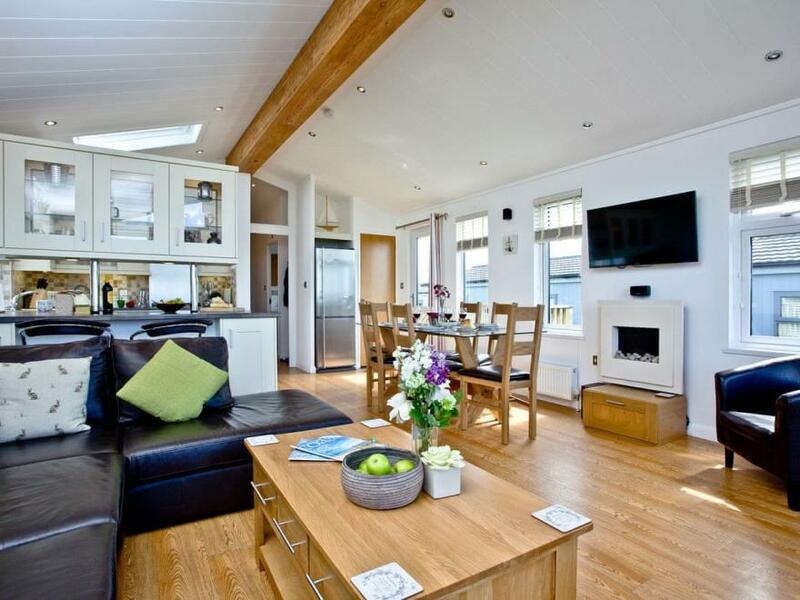 Living area: With electric fire, Freeview TV, DVD player and patio doors leading to decked area. Shower room: With double shower cubicle and toilet.. 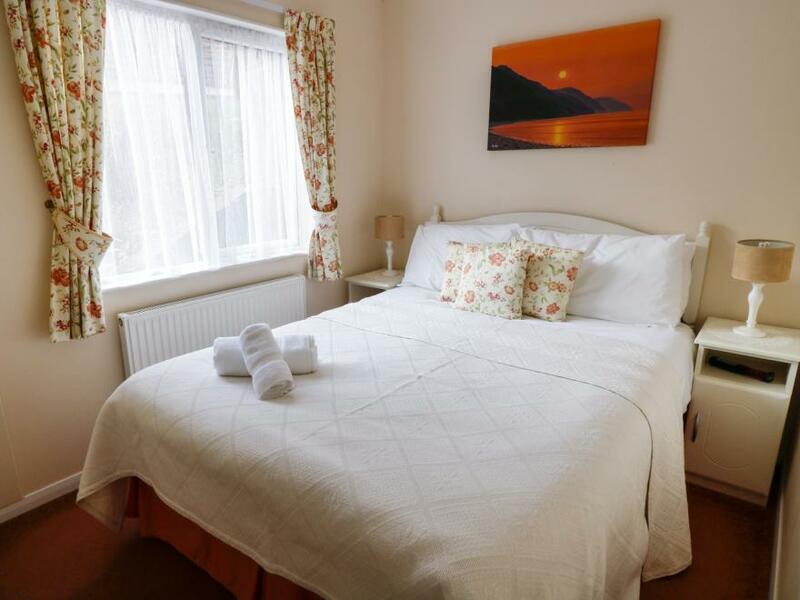 Heating, gas, electricity, bed linen, towels and Wi-Fi included. Cot and highchair available on request. Decked area with garden furniture. Children’s play area (shared with other properties on-site). Allocated parking for 1 car; additional visitors car park. No smoking. Please note: No children under 5 years old. This property has a security deposit of £250.. 22 Salcombe Retreat has been designed by an award-winning team and offers high quality accommodation. This idyllic position is surrounded by National Trust land an Area Of Outstanding Natural Beauty. 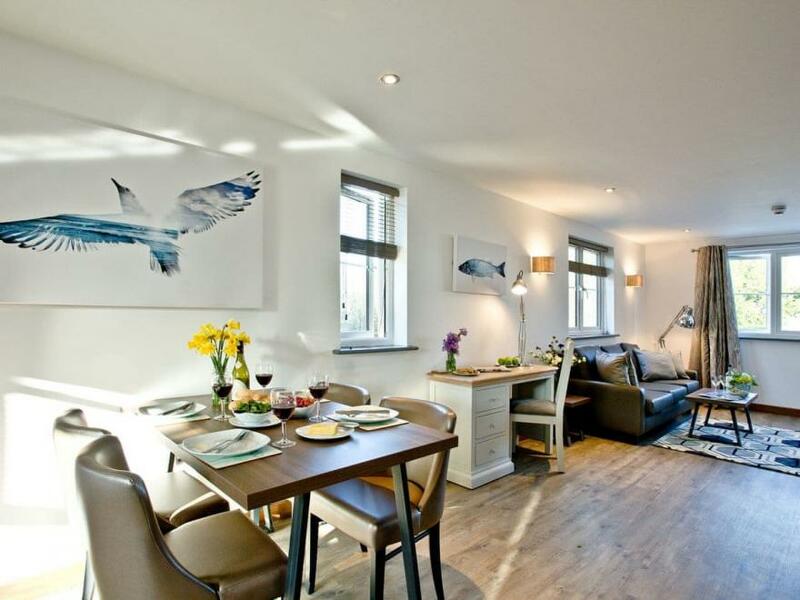 The lodge has been finished with a contemporary feel to its interior that enhances its country and coastal setting. The beach at Soar Mill Cove is a 15 to 20-minute downhill walk away and provides a haven of tranquillity. There is a beautiful sandy beach which is surrounded by cliffs with numerous rock pools to explore and climb and beautiful clear blue waters to swim in. You can also enjoy breathtaking walks on the South West Coastal Path which takes you along some of the most unspoilt coastline in the country. It is also fantastic for bird watching, with regular sightings of gannets and peregrine falcons. Salcombe harbour is a 5 to 10-minute drive away and offers fine restaurants, bars, cafés and individual shops and galleries. 22 Two Little Ducks is a holiday lodge situated in Lynton, Devon, within the Exmoor National Park and on the edge of the River Lyn. The property is all located on the ground floor and it has a double and a twin bedrooms, as well as an open-plan living room with a fitted kitchen and dining area. Outside has a large decking area with furniture provided. 22 Two Little Ducks is ideal for a short break or cosy holiday. 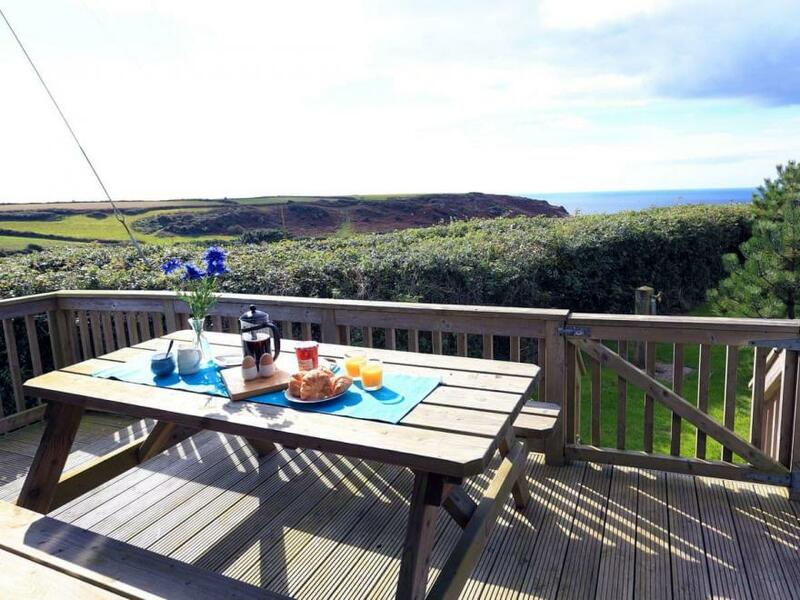 A fantastic family friendly front row lodge, with views over Soar Mill Cove.. 4 steps to entrance. Living area: With gas fire, Freeview TV, Blu-ray player with a selection of DVDs, iPod dock, Xbox 360 with a selection of games and patio doors leading to decked area. Bedroom 3: With bunk bed (for children), Freeview TV and DVD player. Bathroom: With bath, toilet and heated towel rail.. Heating, gas, electricity, bed linen, towels and Wi-Fi included. Travel cot and highchair available on request. Decked area with garden furniture. Children’s play area (shared with other properties on-site). Allocated parking for 1 car; additional visitors car park. No smoking. 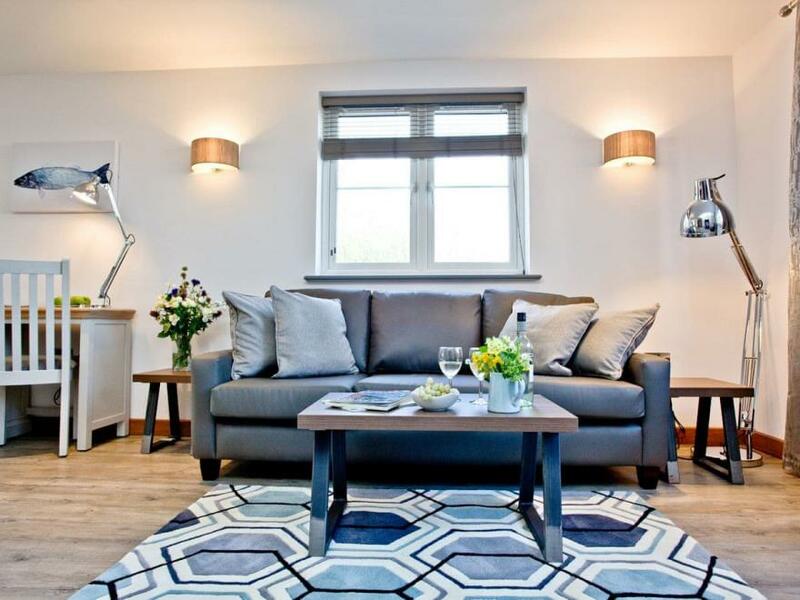 Please note: This property has a security deposit of £150. . 23 Salcombe Retreat is the perfect lodge for a family escape to the South Hams. The lodge is fully-equipped with everything you need to make your family’s break special. As you enter the modern, open plan living area you’ll be struck by the quality, cosy feel that this lodge has to offer. There is a large, chocolate brown leather corner group sofa which is the perfect place to relax in front of a film or be entertained by the games console and range of games on offer. 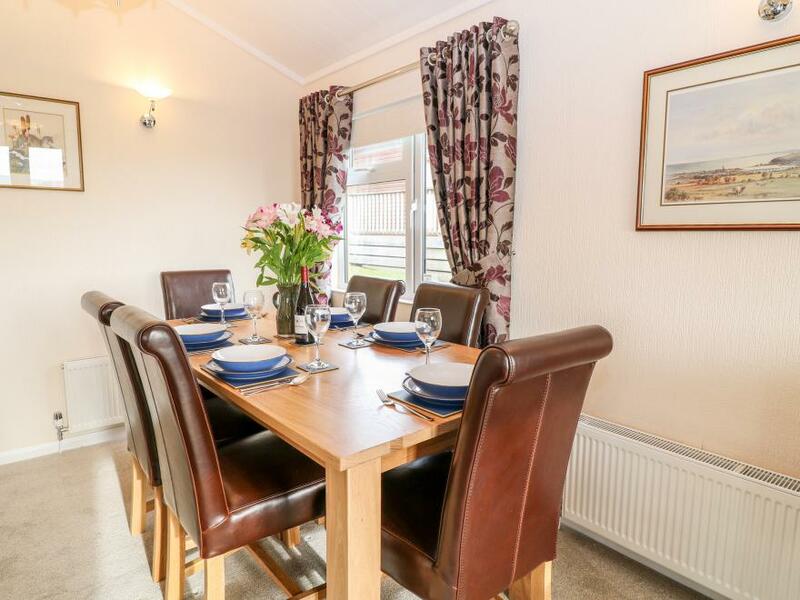 The lodge offers a fully-equipped kitchen and informal dining area with all the amenities one needs for a fun packed holiday in the South Hams. There are three generously-sized bedrooms, the master has a comfortable kingsize bed and large mirrored built in wardrobe. There is also another double room and the third bedroom is perfect for children, with great quality bunk beds, TV with DVD player and built in wardrobes. There is also a travel cot and highchair provided if needed. Salcombe Retreat has a dog exercising area and children’s play area, it’s a 15-minute walk to the beautiful Soar Mill Cove and there are lots of other sandy beaches nearby, such as Thurlestone and Hope Cove. Salcombe town centre is a 10-minute drive away and Kingsbridge is a 15-minute drive away, so if you feel like venturing a little further afield during your stay you’ll find some days out to remember within easy reach. Timber lodge set high in an elevated position. One double and one twin. Bath with overhead shower. Dishwasher and tumble dryer. Gated verandah. Covered outdoor hot.. Bulworthy Forest Lodges is part of our Wanderwood Lodge Holidays Collection, tucked away down a picturesque tree-lined drive leading to Bulworthy Forest in heavenly North Devon. Nestling in 25 acres of woodland teeming with flora and fauna, and boasting five well-stocked fishing lakes, this is the consummate setting for escaping to the country and losing yourself in perfect peace and good old-fashioned family fun. A beautiful, contemporary apartment with an on-site spa and restaurant.. All on the ground floor. Bedroom 2: With kingsize bed, Sky TV and en-suite with walk-in shower, toilet and heated towel rail.. Heating, electricity, bed linen, towels and Wi-Fi included. Telephone. Gym, sauna and steam room (shared with other apartments on-site). Grounds (shared). Private parking for 1 car; additional parking available on-site. No smoking.. There’s something about arriving at Barton Pines that makes you feel as though you can take a deep breath and forget the world. With an interior design that’ll take your breath away, Apartment 37 has been lovingly designed to showcase its peaceful setting. It’s the little touches of luxury that make a stay at Barton Pines a pleasure, and with a kingsize bed to fall into at the end of every day when the kids have drifted off to sleep, it’s the perfect choice for some time out. Life at Barton Pines is all about you, and the collection is home to everything you need to feel a world away from home. There’s a sauna and spa to keep you feeling relaxed. And, for those family meals, the restaurant serves up the tastes and flavours of every season in style. So, you’ll never be more than a few moments from utter tranquillity…bliss. 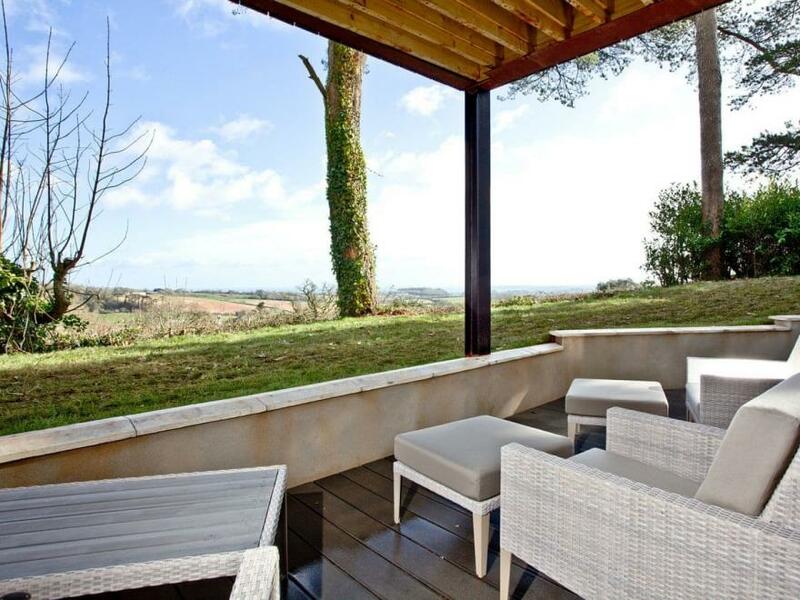 An elegant apartment in the South Devon countryside, with an on-site spa and restaurant.. All on the ground floor. Bedroom 1: With kingsize bed, Sky TV (sports package) and en-suite with walk-in shower, toilet and heated towel rail. Bedroom 2: With kingsize bed, Sky TV (sports package) and en-suite with walk-in shower shower, toilet and heated towel rail.. Heating, electricity, bed linen, towels and Wi-Fi included. Telephone. Gym, sauna and steam room (shared with other properties on-site). Private parking for 1 car; additional parking on-site. No smoking.. Tucked in the peace and quiet of the South Devon countryside, Barton Pines is home to a collection of beautiful lodges and apartments, and the kind of facilities that’ll make you forget the rest of the world. Chefs serve up plates of local foodie heaven in the on-site restaurant, therapists soothe weary limbs in the spa treatment rooms, and the steam room and sauna wait to welcome guests. Or you could even re-invigorate at the gym. Life at Barton Pines is about booking some time out, time to slow down, make memories and enjoy spectacular views of the coast and countryside. Whether you retreat for that romantic break for two or you bring the kids for some family time, Barton Pines has everything you need to enjoy your holiday, your way. 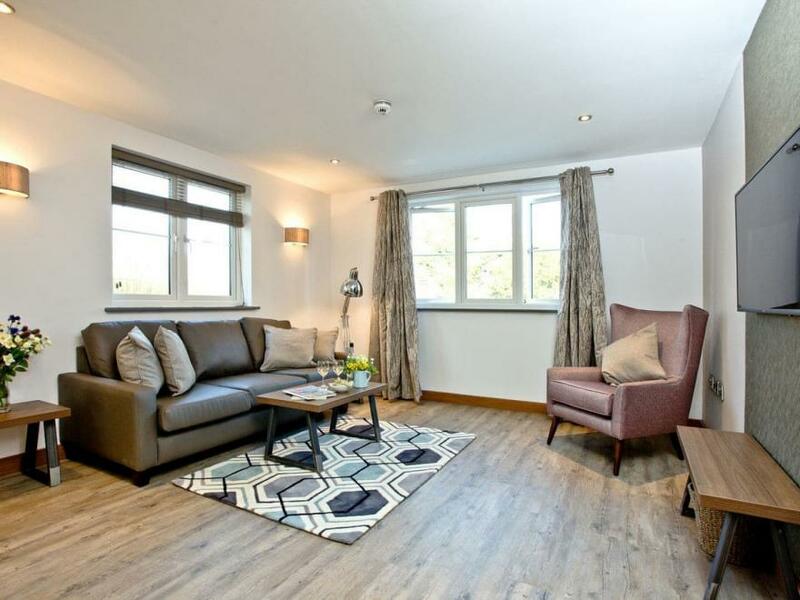 The lodges and apartments in our Barton Pines collection have been carefully designed with the ‘wow’ factor in mind, so expect a décor that’ll take your breath away and an inspiring interior design in every one. Over in the historic main building, the chic apartments have an elegant feel, with several showcasing those stunning Torbay views. And no matter which pad you opt for, you’ll be just moments from wonderful dining and spa experiences. We think your escape from it all should be somewhere that’s all about unwinding in a beautiful setting, and Apartment 38’s perfect. Set at the tranquil Barton Pines, this brand new home from home’s been designed with family living firmly in mind. With the kind of interior design that’ll have you reaching for your camera to show those back home, this apartment’s bright, airy and offers chic touches throughout. While away lazy mornings cosied up on the sofa, and the contemporary kitchen area offers everything you need to cook a hearty full English before you head out for the day. The open plan living area has plenty of space to cosy up together of an evening, and when it’s time to head to bed, you’ll find a gorgeous kingsize waiting to welcome weary heads. Set in the countryside near Blagdon in South Devon, Barton Pines is home to a sauna on-site, spa and restaurant. So, whether you love to start your day with some quiet time, or you’re content to succumb to pampering on the treatment table, you’ll find bliss moments from your home from home. And for those days when you don’t feel inspired in the kitchen, the restaurant means you can tuck into something delicious while you take in the sweeping views of the countryside. Set in the glorious South Devon hills between Totnes and Paignton this contemporary apartment has fantastic on-site facilities. . All on the ground floor. Bedroom 2: With kingsize bed, Sky TV (Sports package) and en-suite with walk-in shower, toilet and heated towel rail.. Heating, electricity, bed linen, towels and Wi-Fi included. Telephone. Gym, sauna and steam room (shared with other apartments). Grounds (shared with other apartments). Private parking for 1 car; additional parking on-site. No smoking.. Treat yourself to a slice of indulgence and calmness at Barton Pines in Devon. Set in the rolling South Devon countryside, Apartment 39 is breathtaking. Step inside the apartment with its boutique feel to begin your journey of relaxation. Start your day with a visit to the fitness suite to really get the blood pumping, before you head back to your apartment for a breakfast cooked in the bright and modern kitchen. And, when you gather the family for that evening meal in the nearby restaurant, you won’t be able to peel your gaze from those views. The apartment has been carefully designed with relaxation in mind, and with the ’You Spa’ treatment rooms ready to welcome the weary and the frazzled, you’ll never be more than a moment away from a touch of bliss. There’s also a steam room and a sauna, so the resort is perfect for a spot of pampering. When you head back to your apartment, open the bedroom windows and spend a restful night in the kingsize bed breathing in that wonderful clean air. In the mornings, enjoy breakfast in bed while watching the news on the flat screen TV or simply listening to the birdsong. This beautiful apartment offers sea views, and use of the on-site spa, gym and restaurant.. All on the ground floor. Bedroom 2: With kingsize bed, Sky TV (Sports package) and en-suite with walk-in shower and toilet.. Heating, electricity, bed linen, towels and Wi-Fi included. Telephone. Gym, sauna and steam room (shared with other apartments). Grounds (shared with other apartments). Private parking for 1 car; additional parking on-site. No smoking.. Step into Apartment 40, Barton Pines and you’ll feel a world away from home. Carefully designed to offer a spacious, open feel that showcases those spectacular views, this apartment makes a homely place to while away lazy days with friends or family...and it’s beautiful. The open plan design enhances that sense of space and room to breathe...and we can’t imagine a more perfect space to unwind for that break. Start the day with a home-cooked breakfast to ease yourself into a day of exploring all that Devon has to offer. Rid your muscles of the work-induced aches with a sauna, followed by a massage at the ’BE You’ spa. At Barton Pines, all you need to relax and unwind is right on the doorstep. After a day of exploring the charming Devon countryside or a visit to Paignton Zoo, you can enjoy a meal at the ’BE Tempted’ restaurant. With something to tempt even the fussiest diner, the restaurant caters for practically every taste. The main bedroom with its en-suite shower room is pure boutique in style. A kingsize bed, flat screen TV and genuine comfort could induce you to spend the day lazing in bed listening to the birds, the flora of the resort is a real attraction and enhances that countryside experience. Drift off to sleep breathing in that clean Devon air and enjoying the peacefulness of being away from the city.